As a homeschooling Mom, I love games that double as learning materials! Think Fun creates games that sharpen the mind and make learning fun. 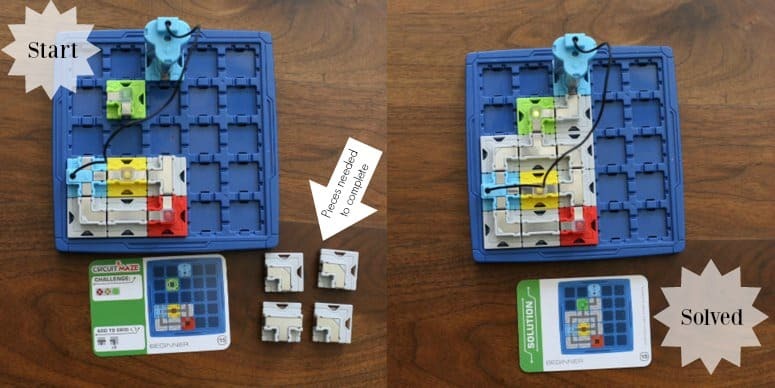 When I learned about the new Circuit Maze game from Think Fun, I knew it would be a perfect fit for my science loving preteen. Learning about circuits and electricity several years ago, ignited her curiosity and desire to figure out how things work. 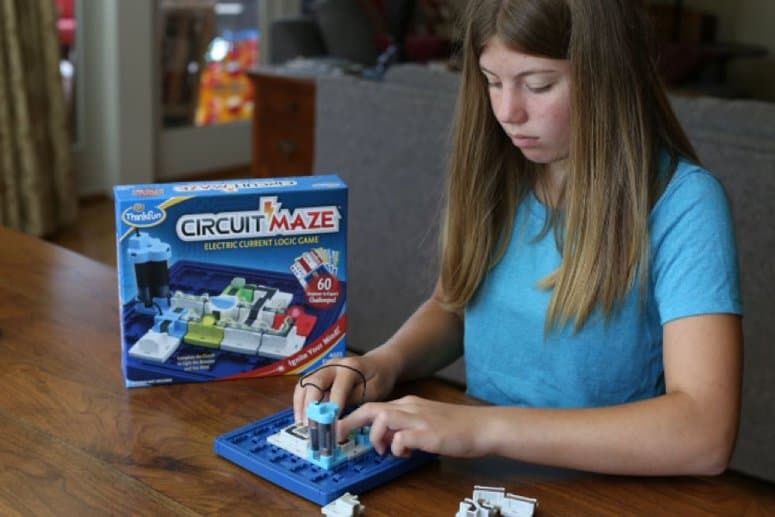 She’s had some hands on learning under the watchful eye of her Grandfather, but electricity is not something she can just experiment with on her own… until Circuit Maze that is! 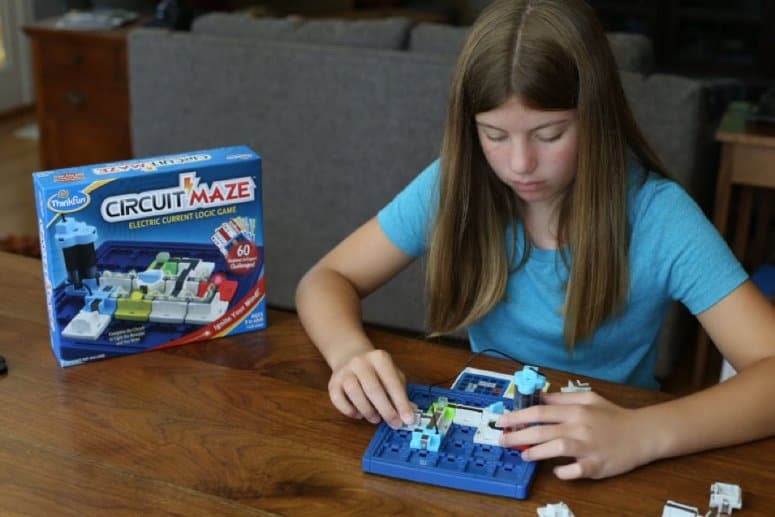 Circuit Maze teaches the concepts of electricity as children (and adults) get creative solving circuit-building logic puzzles. It is a single player game for ages 8 to adult containing 60 playing cards ranging from beginner to expert. This game allows players to experiment with both simple and advanced circuitry – including series circuits, parallel circuits, series and parallel circuits in combination, and parallel circuits in bypass. Simply chose a playing card, place the playing pieces on the board as shown on the card. Next, use the other playing pieces to complete the circuit and light up the beacons. Each playing card not only instructs the player how to set up the board, but also lists the other playing pieces used to complete the circuit. When the beacons light up as shown on the playing card, the correct answer is evident. However the correct solution is also pictured on the back of each playing card. Miriam quickly mastered the basics of the game and moved up to intermediate cards. The solutions on the back of each playing card come in handy when she gets stumped. Rather than turning the card over to find the answer, she asks me or a sibling to check the back and give her a hint. I often tell her what piece is incorrect, or point out where just one piece belongs to get her moving toward finding the solution. 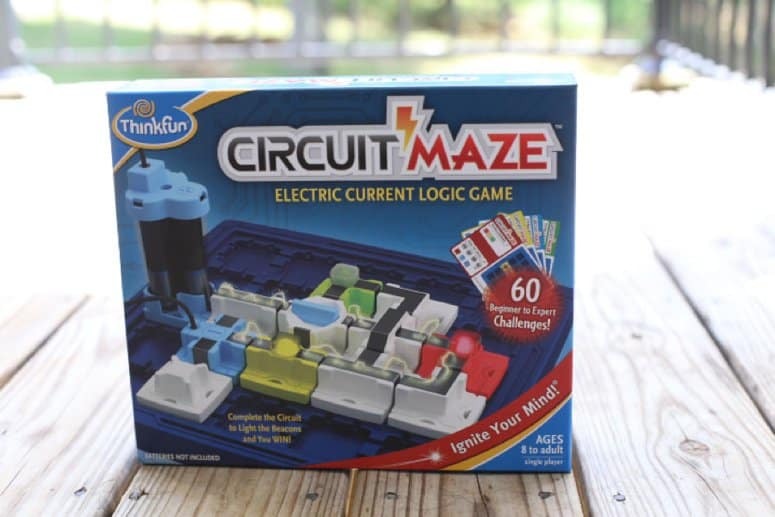 Circuit Maze not only teaches electrical concepts, but it also stretches a players reasoning and logic skills. What a great way to introduce and explore electrical engineering! Circuit Maze is sold individually, and a part of the 3rd Grade Curriculum Package at Timberdoodle. This looks so great! We have a laser maze game and my kids love it. I have one child who is loves all things circuits. This would be perfect for her.